By the 1960s, high schools had become mass institutions saddled with the expectation of universal education for America's youth. Ironically, with this broadening of clientele and mission came the idea and phenomenon of the "dropout." The consolidation of a dropout stereotype focused on the presumed dependency and delinquency of dropouts, with the resulting programs focusing on guidance and vocational training. Why the problem persists is the topic of this study with more constructive perspectives on dropping out. Dorn tells three related sets of stories. First, this book is a story about rising expectations for schooling and the changing role of the high school over this century from an elite to a 'mass' institution. Second, this book is a story about the creation of a social problem and a social class of people that need to be singled out for special supports and services. 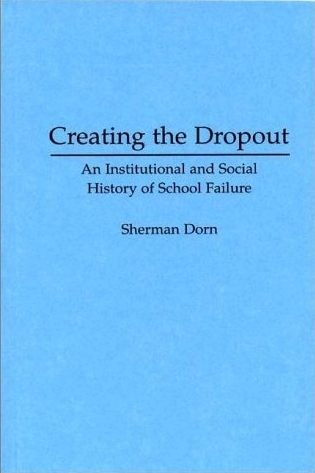 And, third, it is a story about the intransigence of school systems and the ways in which schools buffer themselves from real change to response to new problems....The historical sections of this book are excellent and contribute to an understanding of how concerns over dropouts have shaped school systems' and society's response. The book also serves as a useful policy history.